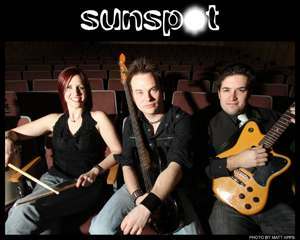 Wisconsin based Sunspot is made up of Ben Jaeger (Guitar & Vocals), Mike Huberty (Lead Vocals & Bass), and Wendy Lynn Staats(Drums & Vocals). The trio from Madison offer up singalong rock with a local flair. Their newest album Singularity was voted Madison’s Rock Album of the Year by the Madison Area Music Association, with the tracks, No Place Like Home being named Rock Song of the Year, and Sweet Relief, Video of the Year. They have opened for acts such as Death Cab for Cutie, The Flaming Lips, Sponge, SevenMaryThree, Hot Hot Heat, and Sick Puppies. Earlier this year they licensed the song “Go, Pack!” to FOX Sports for use during the NFC Playoffs and Super Bowl, events seen by tens of millions of people around the world. Maximum Ink: Can you tell us a little about your background? How do you think coming from where you do has influenced your musical styling? Ben Jaeger: We came from small towns surrounding a medium sized city -Milwaukee. We have spent a lot of time in big cities sharing our songs, but we very much enjoy returning to our roots. Madison has been our home for 15 years now and there are many things that we enjoy about it. It is small enough that people in the music community are accessible and supportive, but the city is large enough that there are plenty of people to interest in being fans. Our music is very real and honest and appeals to a variety of people from sci-fi geeks to jocks to musicians to avid readers. MI: How would you most like to be known to your fans? BJ: We’d like to be known as a group that cares about the people that support us. Art for art’s sake is cool, but I just can’t get into it without people getting enjoyment from what I am doing. We write songs that we like to write, but we also want to do interesting things on stage and on recordings that make audiences want to come back for more. MI: How did the band come up with the name Sunspot? BJ: We brainstormed for a weekend and made lists. It was on Mike’s list, Wendy came back from the weekend and said she had been thinking a lot about the name, Sunspot, and I had written a piano suite for my Grandma’s funeral that contained the name Sunspot as one of the movements. MI: What is it like to work with the others in the band? BJ: We have always been good friends, since our teens. When you go off to college, they warn you about living with your friends, but we have spent thousands of hours in the van together, hundreds of hotel rooms, sharing people’s floors, etc, and we still like each other. I think getting to know each other so well is important because then there is nothing in the way when you write and perform. We don’t have issues with egos, privacy, space, or money so when you take all of those inhibitors out of the equation, you are left with an efficient music machine. MI: Why do you think this band has a certain loyalty to Wisconsin? Wendy Lynn Staats: All three of us were born in Wisconsin, grew up here, and went to college at UW. Our families, friends and all of the people we’ve met in in this state throughout the years have been so great to us, and we’ve had so many memorable experiences here, we can’t help but love it. MI: How would you describe the Sunspot sound? WLS: We have an alternative rock sound- big drums and amps, bass and lots of distorted guitars, punctuated with soaring guitar solos and strong vocals. It’s energetic, fun, pump-your-fist-in-the-air-and-party music with lyrics that you can sing along with, yet still contemplate and extract significant meaning from later. MI: How do you feel about being labeled Singalong Rock? WLS: It’s fantastic! During our live shows, the audience is just as much a part of the show as we are on stage. It’s a positive feedback loop of energy, and if people sing along it only serves to add to the music we’re performing. We are honored that people think enough of our songs to not only want to listen, but bust out in a chorus or chant along with us! That’s part of the experience of live performance that we love. MI: What did it feel like to release the DVD of Major Arcana? WLS: Releasing the DVD was a wonderful conclusion to the hugest project we have ever undertaken. After spending so much time and effort on dreaming up the show, writing new songs, figuring out the technical details, and then performing the show 23+ times on tour, it was truly satisfying to wrap it all up and put a bow on it. Having the entire project- not just the live show, but also the tour podcasts- packaged up in one place also makes it possible for us to share our own incredible personal experience with others. We hope that watching the DVD will be as exciting for viewers as the whole Major Arcana project was for us. MI: Do you have any amusing stories from the road to share with our readers? WLS: We could probably fill an entire magazine just with amusing stories… I can’t count how many times I have thought, life is stranger than fiction while on the road. From the Major Arcana tour, one funny experience was performing at a barbecue smokehouse in San Antonio, Texas. The stage was set up directly in front of the enormous smoker, so in addition to the sweltering heat, we were in a BBQ haze for the entire performance (which actually worked well with the lights- who needs a fogger?). When we showed up at an afterbar party I kept hearing people whisper “I barbecue… do you?”. Our gear hung on to the scent, literally, for at least 4 months after that, so we got to take a little “taste of Texas” home with us. MI: What do you like to do in your free time? MIke Huberty: I’m a sci-fi addict and ghost hunter (in my free time I wrote a haunted history tour of downtown Madison and run a website called Paranormal Wisconsin.) I’m also training for my first marathon this summer. Ben is an honest-to-goodness Eagle Scout, so he’s a fisherman and a real outdoorsman.Wendy is a world traveler, she’s been everywhere! MI: Did you ever dream one of your songs would be licensed by FOX? What has that whole ordeal been like? MH: The whole experience was pretty exciting, we recorded a Green Bay Packers song for a special CD called Tailgate Tunes II and we were just blown away that it got such a great response this year for the Packers trip to the Super Bowl. Signing a contract that said,Super Bowl, made me do a double take and just think, How did we end up here? We’re a band that writes songs about Blade Runner and Dungeons & Dragons and people always remember our song about Scott Bakula. But the Packers unify all Wisconsinites. I’m a fan, I get to a couple of games each season, and our song got to be a big part of Wisconsin Super Bowl celebrations this year. That is about as gratifying as it gets. MI: Where do you hope to see your career go next? MH: We’ve been lucky enough to perform in most of the United States and in 2011 we’d like to return to all of our favorite cities with a big new show. Then our next step is to conquering another continent! Our goal is to share our music and our message with millions of people and that’s where we’re headed. MI: What projects can fans of Sunspot look forward to next? MH: We’ll be in Austin again for SXSW this year and we’ll be performing during the festival. We’ll be having a homecoming show at The Frequency in Madison on Saturday March 26th at 7pm. We’ll be releasing a new EP that night and it’s going to be a huge party!